The seesaw mobile processor battle between ARM and Intel continued at Computex, with ARM claiming it offered better performance per watt for mobile devices than Intel's upcoming chips. ARM's processors go into most smartphones and tablets, but now Intel is challenging it in the mobile device market with its x86 Atom chips. The processor companies are competing on power and performance. Intel has said it has managed to match ARM on battery life in smartphones and tablets with its current Atom processors, and will take the lead with its upcoming Atom chips based on the new Silvermont architecture. But ARM executives dismissed that claim during a news conference at Computex in Taipei on Monday, saying the company's processor designs continue to offer more performance at low power consumption levels, and that it will continue to lead in battery life. "Our analysis shows that we're more than a generation ahead. We've maintained out leadership in this place," said Noel Hurley, vice president of marketing and strategy at ARM's processor division, at the news conference. Hurley responded to a question about the relative performance of the two chip architectures by requesting a benchmark slide backing up his claim to be displayed on a large screen. 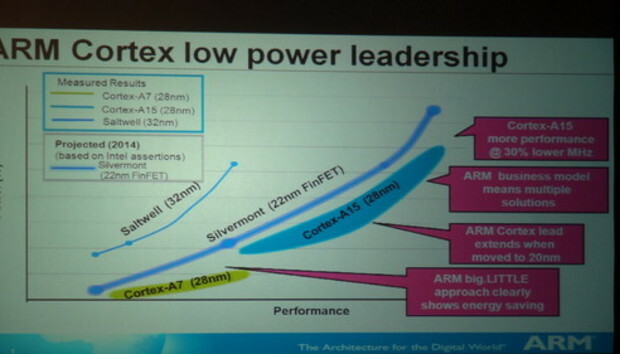 ARM's processors today -- including the high-end Cortex A15 and low-end A7 chips -- will beat Intel's chips based on the Silvermont, said Hurley. Intel has said its Atom chips will be more power efficient and faster than previous Atom chips. The high-performance Cortex-A15 processor provides more performance at "30 percent less megahertz," Hurley said. The Cortex-A15 processor is used in Samsung's Galaxy S4 smartphone and Nexus 10 tablet. "The A15 and A7 on 28-nanometer is outstripping Silvermont on 22-nanometer FinFET," Hurley said, referring to the different semiconductor manufacturing processes used. He implied that even in less densely packed chips made using an older manufacturing process, ARM chips will outperform Intel ones. ARM processors have a lean instruction set and were designed for mobile devices, while Intel's mobile chips have been scaled down from power-hungry PC chips. But as Intel reduces power leakage and improves power management features on its chips, ARM is scaling up the performance of its processors for use in servers and PCs, while also maintaining low-power parts for mobile devices, pitting the two companies against one another in mobile phone, PC and server markets. However, industry observers have said the performance-per-watt battle is over, with Intel and ARM now equally competitive. The future of mobile chips now depends on manufacturing and power management features. Many of the Intel Silvermont's power-saving features come from the 22-nanometer manufacturing process, in which 3D transistors are stacked on top of one another. The 3D transistor stacking, also called FinFET in the semiconductor industry, is considered the biggest chip manufacturing breakthrough in the last decade. Unlike Intel, ARM-based chips do not have 3D transistor stacking features. But ARM is catching up on that, Hurley said. Third-party chip manufacturers GlobalFoundries and TSMC (Taiwan Semiconductor Manufacturing Co.), which make ARM-based chips for companies like Qualcomm and Nvidia, are expected to implement 3D transistors in 2014 or 2015. ARM chips can also be combined into low-power and high-performance cores, a flexibility not provided by Intel, Hurley said. He was referring to ARM's Big.Little technology, in which low-power and high-performance cores can be combined on chips for improved power efficiency relative to performance. Samsung uses the design on its Exynos 5 eight-core chip, which has four high-performance Cortex-A15 cores for demanding tasks like graphics, and four Cortex-A7 low power cores for mundane tasks like MP3 playback or text messaging. ARM executives also pointed out a software advantage, saying most gaming applications are natively written for the company's processors. While ARM has a lead in mobile, executives did not dismiss Intel, saying x86 will have a long life in computing products like PCs. But PC shipments tumbling and mobile on the rise, ARM is poised for growth, said Ian Drew, chief marketing officer of ARM, at the news conference. "We see this market being significantly larger than PCs," Drew said.